Animal Adventures: Sharks will take you beneath the ocean’s surface to meet the many sharks that lurk in the depths. Have fun while learning, encounter sharks—large and small, gentle and fierce—with colorful illustrations and fascinating facts, and then build a diorama. Everything you need to explore the ocean is right here. 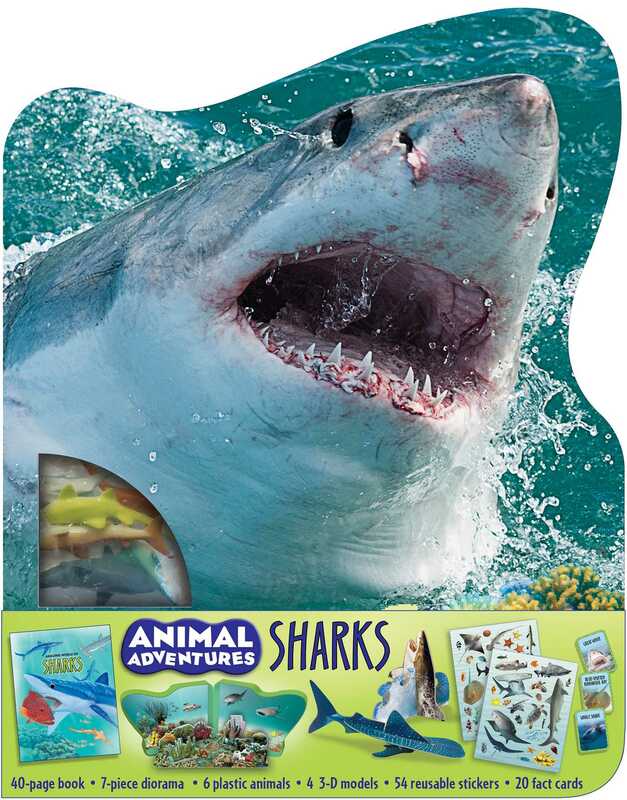 This unique set with a lenticular cover includes a book full of colorful illustrations and intriguing facts about sharks, plus 3-D animal models and a diorama with reusable stickers. Journey to all the world’s oceans to learn everything you need to know about these mysterious creatures. Animal Adventures: Sharks offers a unique learning experience as you meet wild and exotic animals face-to-face. Cynthia Stierle lives with her husband and two children in Connecticut. Her love for reading began when she was a child, and she feels lucky to have worked in publishing as both a writer and an editor. She’s written more than fifty children’s books, both fiction and nonfiction, and she still enjoys reading (and writing!) a good story.